Seattle is usually spectacular in the summer, as the gray skies and drizzle is replace by clear and crisp summer days. So I was pleased to hear we’d be driving the redesigned 2012 Nissan Versa in the Great Northwest in July. The weather cooperated for the most part and I was able to test the pre-production vehicles in both city and highway settings while taking in some of the sights around Seattle. Nissan has completely redesigned the 4-dour Versa for 2012, while the update for the 5-door hatchback will come a little later. 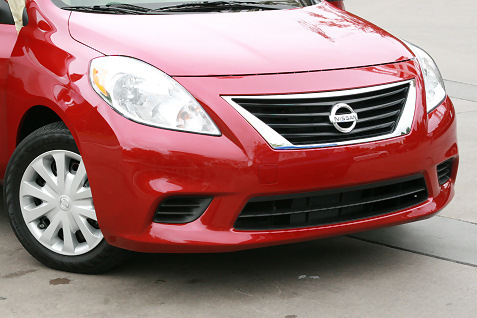 The new Versa is the first Nissan model to sport the new front grille for sedans, which is a huge improvement over the previous Nissan grille. That combined with the stylish headlights completely changes the look of the vehicle. It’s more polished and elegant that its predecessor, giving off the impression of a more expensive sedan. The previous model had a more vertical feel to it, while the new Versa has a much more aerodynamic look. The lines of the new Versa are clean and sophisticated, and this will appeal to small car buyers who are turned off by the edgier designs from competitors that are common in the compact segment. I was impressed by the look of the car from all angles as I walked around it. The interior was roomy and comfortable. The interior comes in two colors, charcoal and sandstone, and both fit nicely with the new exterior design. Again, consumers who prefer a more elegant vehicle over an edgy design will be pleased with the new Versa. It’s also very roomy in the back seat and has best in class trunk space, making it very practical for buyers who expect to have passengers and cargo. The Versa features a continuously variable transmission (CVT), so you won’t feel gear changes as you’re driving the vehicle and accelerating. The new Versa sports Nissan’s second-generation CVT design, improving fuel mileage over the previous model by 5 MPG. The Versa now gets 30 MPG City, 38 MPG Highway and 33 MPG combined. Nissan official stressed that the combined mileage was tied for best-in-class, as the CVT provides great mileage performance in city driving. It also features a new 1.6-liter engine with 109 horsepower @6,000 rpm and 107 lb-ft of torque at @4,400 rpm. I liked how the Versa felt, particularly in city driving where the CVT performed nicely. It has competitive power for vehicles in this class and solid handling. The 1st generation Versa was introduced in 2006 and was the U.S. segment share leader for the in 2010. The small car segment is growing rapidly as more buyers look for fuel economy, and with this update we can expect the Nissan Versa to continue to be a sales leader in this space. Consumers will have many choices as more brands enter this space, and the new design will appeal to many consumers drawn to a more elegant look. It will appeal to many younger buyers and consumers looking for a commuter vehicle. The Versa has the lowest standard MSRP of any vehicle in this space at $10,990 for the S MT. This entry-level model has few options and has a manual transmission instead of the CVT but is equipped with standard air conditioning and a radio. The S CVT starts at $12,760, the SV CVT starts at $14,560 and the SL CVT starts at $15,560, and you can add a Tech Package with Navigation, XM radio and USB for an additional $700.